When was the last time your fire alarm was tested? Businesses rely on fire alarms to protect themselves and their employees from any fire and smoke. However, when gone untested and uninspected, severe dangers are likely to occur. Having your fire alarm system tested on a regular basis will ensure that your business and employees are safe from any potential fire hazard. If your fire alarm system does not operate properly and there is a severe fire hazard, the likelihood of people getting injured increases substantially. If not maintained, your fire alarm will not be able to work properly. And the only way to determine whether or not it is working, you need a professional to come and inspect it. Most insurance carriers likely will not pay for any damages as a result of a unmaintained fire alarm. Insurance companies require proof of fire alarm maintenance and without it, they are likely to find you at fault for failure to maintain and inspect your fire alarm. It’s very likely that your insurance companies will give you a discount if you can show proof of proper care and maintenance of your fire alarm. There are a variety of legal requirements about fire alarm maintenance and most commercial buildings have codes that need to be followed. It’s always important to check with your local fire and building departments for the proper maintenance requirements of fire alarms. 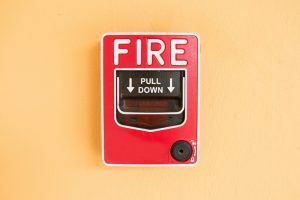 If a business’ fire alarm stops working or is simply not properly maintained and people are injured as a result, this could cost a business a huge sum of money in damages. Liability would rest on your shoulders for failure to maintain a proper fire alarm system, leaving your business drained financially, potentially losing the business as a result. By properly inspecting and maintaining your fire alarm system, you are reducing a significant portion of Fire Department time and money. By eliminating any random fire alarms going off due to poor or improper maintenance, you allow community resources such as Fire Departments to attend to actual emergencies, instead of false alarms. Anderson Fire Protection has the expertise and skill to help your home or commercial property upgrade to the latest smart smoke detectors. We have been working in the Maryland, Northern Virginia, Southern Pennsylvania, and Washington, D.C. areas for over 25 years, and we are known for our top-notch customer service and high-quality results. If you are ready for fantastic fire prevention and protection services, from fire sprinkler installation to fire alarm design and consulting, give us a call at (410) 796-4915 or visit us online. For more fire safety tips to keep your property safe, follow us on Facebook, Twitter, LinkedIn, and Google+. This entry was posted on Friday, January 13th, 2017 at 4:10 pm. Both comments and pings are currently closed.